During the five or six years following his entry into the Society of Mechanics and his becoming a Burgess, Bowie appears frequently throughout the Burgh accounts. The sums are small and suggest that he was mainly engaged on jobbing contracts or repairs, renovation and alterations to existing properties. His major, and most notable, building work began after 1810, when the feuing plan of Allan Park was undertaken by William Drummond, land surveyor and nurseryman, whose immediate descendants were responsible for a wide range of activities both locally and nationally. These included the establishment of an agricultural museum in the 1830's, an extensive seed and nursery business, exploration in Africa and the Drummond Tract Enterprise, the foremost 19th century publisher of religious pamphlets. In 1814 Bowie drew up plans for a mealmarket to be built. These were never used and Allan Johnston's Athenaeum was built instead at the top of King Street. A major public works contract was undertaken by Bowie in 1816 when the Town Council decided in March of that year to culvert the Town Burn where it flowed through the Allan Park on its was from the King's Park to the River Forth. The burn followed the South side of Dumbarton Road to near the Old Burgh Gate and then under the line of the Town Wall. ( See Allan Park Map ) The Council contract states that three openings be left for cleaning the burn and that a 'Watering Place' be left for the residents of Allan Park. This was to ensure that they would have access to 'water both for their families as well as for watering their cows'. By 1815 only two houses had been built on the Allan Park feus and in 1816 Alexander Bowie acquired lot 13 on the east corner of Allan Park and Dumbarton Road. On this piece of ground he built Nos. 1-9 Allan Park and Nos. 35 and 37 Dumbarton Road, the present opticians house and shop. In a fit of national fervour Bowie seems to have named the new block of houses, Wellington Place, Allan Park. The feu superior of the Allan Park land, was Allan's Mortification Trust, set up in 1724 by John Allan, for the education of poor boys who were sons of members of the Seven Incorporated Trades. NB Add a bit more about Georgian style of Architecture in general and Edinburgh New Town's possible influence on Bowie. The building instructions laid down by them were quite specific requiring Bowie to build houses 20 feet in height, to have two floors, regular hewn doors and windows and to be finished with slate roofs. It is open to conjecture how he managed to interpret these instructions to enable him to build 5 houses linked by a common facade and design displaying more than a passing degree of similarity to the houses in Edinburgh's New Town. Here we see classical terraces featuring pillars, pediments, rusticated stonework, railings and distinctive fanlights. All the hallmark of the Georgian town house and all to be found in Bowie's buildings. Indeed these five houses and the balanced block containing Nos. 2, 4 and 6, built about 1826 are the only examples of such Georgian terraced housing in Stirling. "Early 19th century. 2 storey and basement ashlar classic, with segmental arched features, 4-windowed pedimented semi detached unit + 2-windowed single house + 4 windowed pedimented semi-detached unit ground floor part rusticated, 2 fanlight doorpieces at No 1 & 3, railed steps. Slated roof. Tunnel linking front to rear garden adjoins gable of No 9". Nos. 2---6 are described as " Early 19th century. 2 storey and basement, ashlar classic (corresponding to Nos. 1 - 9) 3 bay pedimented + 3 bay + 3 bay pedimented; units, 9 window front ground floor part rusticated, railed steps. Slated roof. Over the years to 1829 Bowie built fourteen of the twenty-two houses in Allan Park. Houses which are distinctive because of the use of ashlar sandstone rather than the local brown whinstone taken from the many small quarries on the Castle Rock. The extensive use of sandstone lends itself to fine detailed carving. 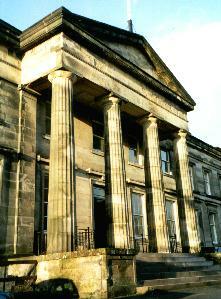 Historic Scotland listed Craigs House on the 4th november 1965 and described it as being ; "Early 19th century. 2 storey 3 window classic villa of elaborate character, ashlar fronted, top balustrade, slightly advanced centre bay, Roman doric porch with curved ends,fanlight with segmental shell heads and elaborate herring-bone fluted panels. Main cornice, hipped, slated roof. " The identification of the building that was built in 1827 for the Commercial Bank located at 39 Spittal Street, Stirling as being the most prestigious public building built by Alexander Bowie came about by a throwaway comment that Bowie wrote in a letter to his son William in September 1827. ( to be discussed in detail in Chapter 2) In this letter Bowie says 'nothing new ---only we are getting on with the Bank'. The fact that Bank was written with a capital letter suggested that it referred to a Banking establishment rather than to, say, a river bank and the only Bank built around that time, in Stirling, I knew to be the Commercial Bank in Spittal Street. A striking building along classical lines that, when the Bank was finished with it, became the first Royal Infirmary of Stirling (1874), in the 20th century it was the Education Department Offices and now is the Headquarters of the Forth Valley Health Board. Until reading that phrase in william's letter no thought had ever been given to the possibility that Alexander Bowie may have built it. The search for information to test out this hypothesis involved George Dixon the Stirling Archivist, Bob McCutcheon, Antiquarian Bookseller, Andrew Mclean, Archivist of the Royal Bank of Scotland an establishment that bought over the Commercial Bank. The outcome of the search was to confirm that the building was indeed built by Alexander Bowie to a design of William Stirling of Dunblane. The evidence In the Stirling Journal for 16th February, 1866 in a general discussion about the history of the commercial bank in Stirling and the influence of James morrison and his son James M. Morrison the agents, we read " Purchasing old property at the head of Bank Street they erected a handsome edifice of fine polished ashlar-work, adorned with a Grecian portico supported by fluted columns and having a chaste proportionate pediment. The Architect was the late Mr Stirling of Dunblane and the builder Mr Bowie of Stirling." More accurate proof is to be found in the minutes for a Board of Directors meeting of the Commercial Bank for 21st June 1827 when it was agreed "to accept the offer my Messrs. Thomas Traquair and Alexander Bowie for building the Bank's House at Stirling at the price of �1960 and direct the work to be proceeded with without delay"(CS/13/2, p529). The work involved included building an attached dwelling house for the use of the branch agent and appears to have been completed by 1828 (CS/249/2). The building was listed in ----by Historic Scotland and they detail it in their listing as being " Neo-classical, 2 storey and attic. original bank building 5 bay frontage giant antra order and tetrastyle fluted Greek Doric portico with pediment approached by steps contained within massive podia, architraves and cornices at ground floor windows, heavy entablature and blocking course slated roof." During the excavation of the foundations for the Commercial Bank Bowie's workmen uncovered some Roman remains. Many other distinctive sandstone Georgian houses that reflect Bowie's 'Allan Park style' are to be found in Melville Terrace and Upper Bridge Street. Whether they too were built by Bowie must, at present, remain in the realms of conjecture. To the rear of Nos. 1-9, Allan Park, on part of his original Lot 13, Bowie established his stoneyard. (See Allan Park map ) This site was convenient to the town's whinstone quarries but a considerable journey from his own sandstone quarry at Thorndyke or his flagstone quarry at Drumhead, both of which are situated near Denny some 7 miles distant. Presumable he carried the rough hewn stone by cart to his stoneyard at Allan Park where his masons would dress it according to their needs. The yard itself was situated in the backlands between Port Street, Allan Park and Dumbarton Road with access from the latter. As late as 1858, the 25 inch Ordnance Survey Plan shows a yard on that location, although by then used for timber rather than stone. aWe can deduce some more information about the yard becausefter Bowie's death in 1829 the stoneyard and business were advertised for sale as a going concern. An advertisement in the Stirling Journal & Advertiser for 21st January 1830, however, indicates that the stoneyard was available to let for a period to be agreed and that the equipment consisted of a stable, a barn and granary with a pump and well plus other accommodation. In addition there was a quantity of both dressed and undressed stone available. The unsold builder's yard presumably remained let providing some income to the Bowie estate. Indeed it remained in Trustees hands until well into the 1870s.